This statistic represents the price of European and US natural gas from 1980 through 2017, and provides projections up to 2030. 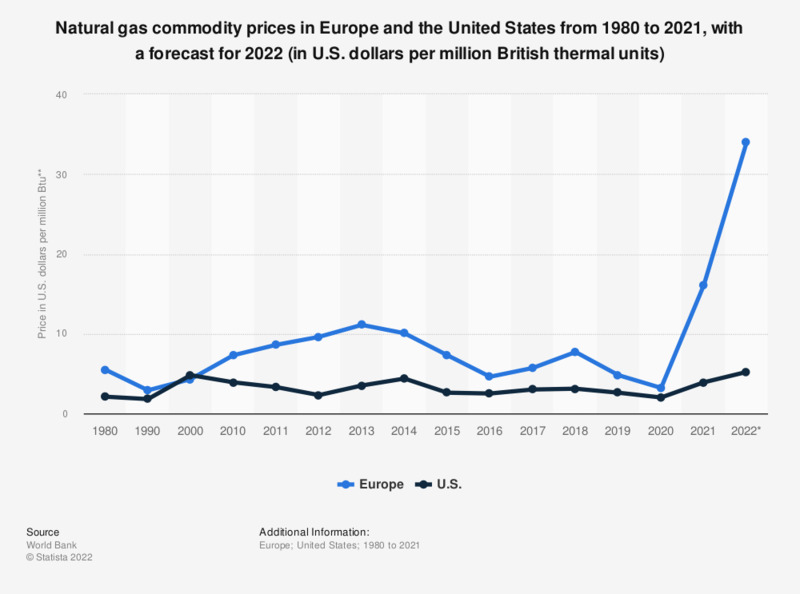 In 2030, the price of natural gas in Europe is expected to reach about 8 constant U.S. dollars per million British thermal units. For millions of years, a combination of decayed plants and animals has been trapped beneath sand, silt and rock. Over time, pressure and heat changed some of this organic material into tiny bubbles of odorless gas. Given the fact that the world’s demand for energy is growing at a rapid pace, natural gas is seen by many as a good alternative to other energy sources. It is a more mature technology than most renewable energy sources and is viewed as much more environmentally friendly than coal or nuclear sources. In the transportation sector, natural gas is set to replace petroleum as a fuel in motor vehicles or ships. The combination of hydraulic fracturing (“fracking”) and horizontal drilling can be regarded as one of the energy industry’s biggest breakthroughs in decades, with the United States being the largest beneficiary. The new technology has helped the energy industry to release unprecedented quantities of gas from deposits, mainly shale and tar sands that were previously thought either inaccessible or uneconomic. It was predicted that U.S. shale gas production would reach 16.7 trillion cubic feet in 2040, up from 360 billion cubic feet in 2000. As a consequence of increased supply, the price of natural gas produced in the United States tumbled from over 4.80 U.S. dollars per million British thermal units in 2000 to around 2.9 U.S. dollars per million British thermal units in 2018. * Prices in constant U.S. dollars. The figures from 2018 to 2030 are projections; the figures from 1980 to 2017 are already accurate. Everything On "Global natural gas industry" in One Document: Edited and Divided into Handy Chapters. Including Detailed References.